I first landed in East Africa in 1991 as a 19-year-old student of wildlife management and almost instantaneously the beauty and vastness of the land and the kindness and generosity of the people rooted themselves deep within my heart. During the three years that followed, which were spent traveling, living, studying and working in and out of Tanzania, life was filled with wonder, adventure, excitement and, at times, wild challenges and severe discomfort. When things became unbearable, as they did more than once—due to the mere good fortune of where and to whom I was born—I could evacuate and access safe lodging, clean water, healthy food, quality healthcare... Those around me could not, and the injustice of that inequality has haunted me ever since. Years later, in January 2008, while sitting with my husband David in our suburban Connecticut home watching our three daughters, then ages 2, 4 and 6, play, I surprised even myself when I said out loud: “It is time for me to go back Tanzania and find a way to be part of the solution.” With no clear plan besides a heartfelt calling to serve, David and I landed in Dar Es Salaam five months later. There we were met by our friend Father Dennis Mnyanyi who picked us up in a borrowed vehicle from his village, an ancient Izuzu belonging to the Bishop. For hours we bounced along over barely-there roads to reach Dennis’ home, a simple cement structure with a tin roof nestled in the forested foothills of the Uluguru Mountains. Along the way, groups of smiling barefoot children chased our car calling out “Mnzungu! Mnzungu!” (White person! White person). This familiar chant followed David and me over the next few weeks (and throughout every visit since) as we traveled the country meeting with NGOs (non-government organizations), clergy and non-profit leaders; visiting schools, hospitals and development projects; and witnessing just what real poverty, resilience, courage and hospitality look like. It was then that the vision for Unite was born. Shortly thereafter we launched Unite The World With Africa LLC, a social enterprise under which we operate our Unite Tours Service Safaris, partnering with local outfitters to combine personalized wildlife safaris with opportunities for travelers to discover, learn, share and serve in the field. 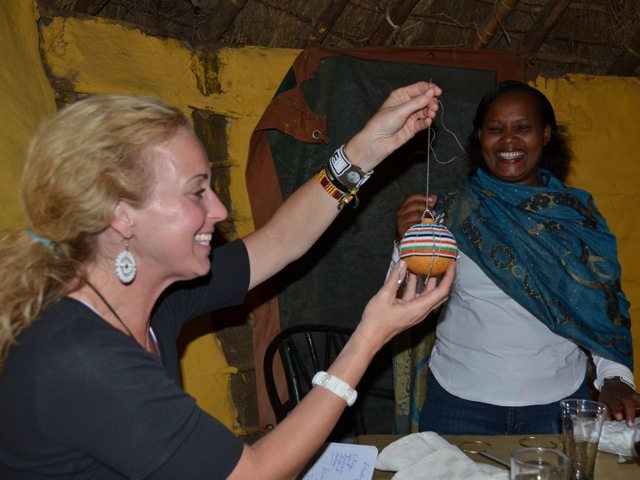 Under the LLC we have also purchased and sold hundreds of thousands of dollars of African product to drive job creation and security for artisans across East Africa and to redefine what ethical fashion looks like here in Ameria. For the first few years we searched for and partnered with existing NGOs who were doing transformative work (and could meet our strict reporting criteria) and drove donor support through them; however, the call to venture further afield, deeper in the bush to serve and empower those living in greatest need was too strong, so in 2014 we incorporated our 501c3 Unite The World With Africa Foundation. According to a professor of African political thought at Cornell University, Olúfẹ́mi Táíwò, Africa’s largest crisis today is not a lack of water or food but instead it is a lack of knowledge. In Tanzania alone, there are ~25 million children under the age of 16 (43% of the population) who are eager to learn and desperate to receive an education; however, few will get the opportunity. Unite’s current key programs, which are outlined in the pages that follow, all now focus on addressing this knowledge crisis by creating and providing access to high-quality education (pre-primary through university), international mentorship and comprehensive life skills programs designed to empower the growth of leaders who can and will become the positive change agents and thought leaders of tomorrow. The flow of knowledge, of course, goes both ways. I personally have learned countless lessons working in and out of a culture so different than my own, where strangers are regularly welcomed to share last cups of tea, celebrate new life and honor the sick and dying; where there is no perceived need for speed; and where divine intervention is assumed, anticipated and even incorporated into life plans. Years ago I traveled with Sister Crispina Mnate, director of the St. Joseph’s Orphans Center, to a boarding school to visit a few of her teenage boys who are sponsored by Unite. When the boys walked to meet us, I noticed their toes sticking out through their worn and tattered shoes. Since the school required them to run ~5 miles every morning, I thought it would be nice to buy them each a new pair of sneakers and a new pair school shoes. Sister Crispina reprimanded me. “Anne Wells,” she said sternly. “No more than one pair each. You must never take away their struggle.” Time and time again, I have experienced the wisdom in these words: Bigger is not better, and easy can undermine. With this in mind Unite is small and focused by design. We are “in it” for the long haul, working closely alongside those we serve with near daily communications, an in-country support staff and regular site visits by myself and other Board Members and Advisors not only to protect our investment but to do all that is necessary to achieve our shared greater goal, which is to break the complex and multifaceted chains of extreme poverty—one of the greatest threats to Planet Earth today. I am deeply grateful to each and every soul who has supported this work in any and all ways, big and small, over this past decade; to our team of Advisors for their time, generosity and expertise; to our Board of Directors for their remarkable commitment and for making it possible for 100% of every donor dollar to be allocated directly to our programs in Africa; and to the couragous souls I have met along the way who have given up everything to live on the frontlines of this work. Together, you fuel my passion and help me resist the occassional tug of fatigue or allure of apathy. May we continue with our individual and collective efforts to love, heal and honor one another and ourselves. The stakes are high. All outcomes are possible. Thank you for your time in reading this report and for your continued support of Unite.